Coral Gables City Hall was designed in 1927 in the Mediterranean Revival style by local architect Phineas Paist and artistic advisor Denman Fink. The Coral Gables City Hall is one of the city's finest civic buildings and a focal point when entering the city. The richly ornamented building is constructed largely of coral rock. The tower interior is highlighted by a mural, painted by Denman Fink, which depicts the four seasons. 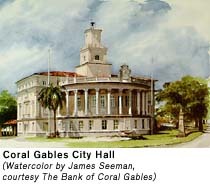 The Coral Gables City Hall is at 405 Biltmore Way in Coral Gables.